Finance for $1,378 per month at 3.99% APR for 72 months with $10,566 down payment. Payment expires on 04/30/19. Estimated Finance payment based upon 3.99% APR for 72 months, with a down payment of $10,566. Excludes title, taxes, registration, and license fees. Some customers will not qualify. See your authorized dealer for complete details on this and other offers. Residency restrictions may apply. NAV, Heated Leather Seats, Sunroof, COLOR HEADS UP DISPLAY, LIMITED SLIP DIFFERENTIAL, WHEELS: 21" FORGED ALUMINUM, ALL WEATHER PACKAGE, CONVENIENCE PACKAGE, ACCESSORY PACKAGE. CAVIAR exterior and BLACK interior, LC 500 trim. AND MORE! PERFORMANCE PACKAGE Carbon Fiber Scuff Plates, Carbon Fiber Roof, Active Rear Steering, dynamic rear steering, Heated & Ventilated Front Sport Bucket Seats, 10-way power driver seat, 2-way power driver and passenger lumbar support and memory for driver, Variable Gear Ratio Steering (VGRS), Active Rear Spoiler, Alcantara Head Liner, WHEELS: 21" FORGED ALUMINUM Tires: P245/40RF21 Front & P275/35RF21 Rear, RADIO: MARK LEVINSON PREMIUM SURROUND SOUND SYSTEM AM/FM tuner, DVD/CD player, 13 speakers, advanced discrete amplifier design w/835 watts max, power and 7.1-channel speaker architecture, CONVENIENCE PACKAGE Blind Spot Monitor, lane change assist and rear cross traffic assist, Front & Rear Clearance Backup Sonar, COLOR HEADS UP DISPLAY, LIMITED SLIP DIFFERENTIAL, ALL WEATHER PACKAGE Windshield De-Icer, Heated Steering Wheel, adjustable temperature settings and warmth for driver's hands regardless of grip position, ACCESSORY PACKAGE Cargo Net - Spider, Carpet Trunk Mat, Key Gloves, Alloy Wheel Locks. 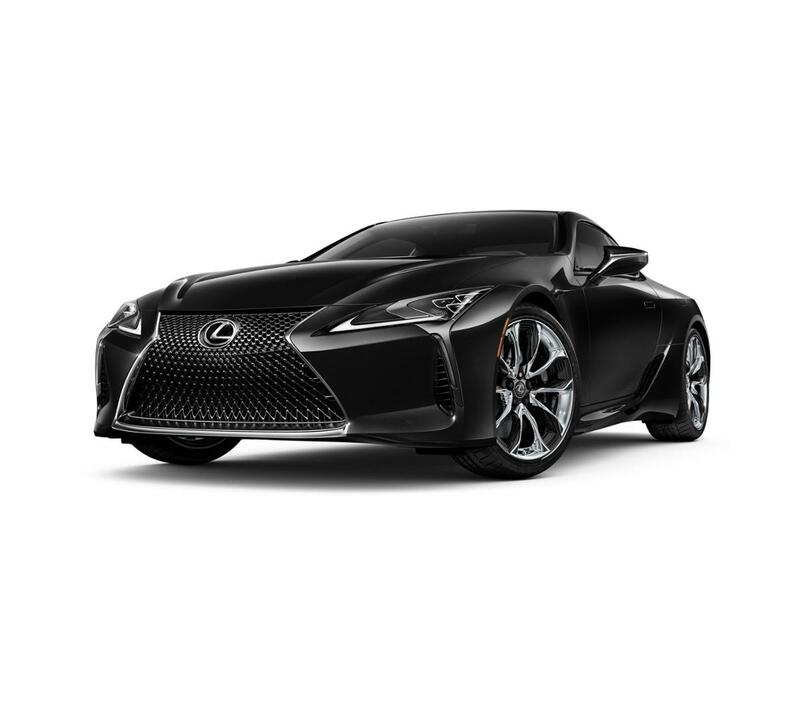 Contact Lexus Santa Monica at (424) 229-9998 or online to learn more about this Lexus LC 500 for sale near Santa Monica. See this LC 500 at our lot! At Lexus Santa Monica in Santa Monica, we have the new and used vehicles you have been looking for! This Caviar 2018 Lexus LC 500 , is available right now at your Santa Monica Lexus dealership. Call us at (424) 229-9998 if you have any questions about this Lexus or any of the other vehicles at our Santa Monica Lexus car dealership. Lexus Santa Monica offers this Lexus LC 500 for sale. All our new and used vehicles undergo an inspection to make sure they're of high quality and worthy of being offered at our dealership and this LC 500 is no exception. View all the details on this vehicle above and then come see it in person at our dealership and take it for a test drive. If it turns out this Lexus LC 500 isn't for you then we have many, many other vehicles to choose from. If you have any questions regarding this Lexus LC 500 or any other vehicle we offer for sale don't hesitate to contact us at (424) 229-9998. Prices do not include additional fees and costs of closing, including government fees and taxes, any finance charges, any dealer documentation fees, any emissions testing fees or other fees. All prices, specifications and availability subject to change without notice. Contact dealer for most current information. MPG estimates on this website are EPA estimates; your actual mileage may vary. For used vehicles, MPG estimates are EPA estimates for the vehicle when it was new. The EPA periodically modifies its MPG calculation methodology; all MPG estimates are based on the methodology in effect when the vehicles were new (please see the Fuel Economy portion of the EPAs website for details, including a MPG recalculation tool). The features and options listed are for the new 2018 Lexus LC 500 and may not apply to this specific vehicle. MSRP contains base MSRP, any factory installed options, and delivery, processing and handling charges. Delivery, processing and handling fee is based on the value of the processing, handling and delivery services Lexus provides, as well as Lexus overall pricing structure. Lexus may make a profit on the delivery, processing and handling fee.